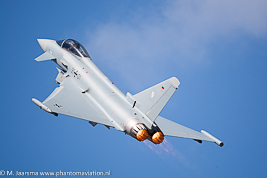 Company: Eurofighter consortium. Consortium of Airbus D&S, BAe Systems and Leonardo (Alenia-Aermacchi). Airbus D&S reported 747 ordered EF-2000s / Typhoons until December 31, 2017 (excluding an order by Qatar for 24 aircraft - contract not signed). The total number for Airbus D&S would cover 771 aircraft as shown in the table below. From 2018 the reported numbers were revised. Combat aircraft provided a breakdown consisting of 623 ordered aircraft (tranche 1, tranche 2 and tranche 3A signed and tranche 3B not signed). Country Order. Airbus Dev. Del. TB del. Airbus D&S Austria, Germany, Spain. BAe Systems Oman, Saudi Arabia, United Kingdom. On July 7, 2017 the Austrian government announced it plans to stop operating the EF-2000. The fighters can be withdrawn from service from 2020. The original contract for 18 aircraft was changed to 15 with nine aircraft being delivered from the German Air Force production line. 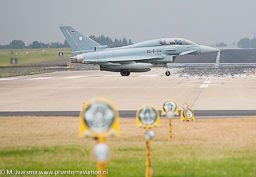 The German MoD will buy 33 EF-2000s to replace the same amount of Tranche 1 aircraft. The aircraft are also referred to as F-2000 (single seat) and TF-2000 (dual seat). 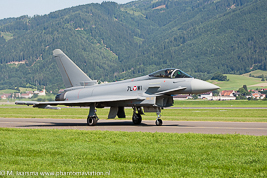 The 500th EF-2000 / Typhoon was delivered to the Italian Air Force. The first two aircraft were delivered from Warton on June 19, 2017. Airbus D&S reports three aircraft deliveries made by June 30, 2017. The contract for the purchase of 24 Typhoons was signed between the Qatari and UK Defence Secretaries on December 10, 2017. It follows the Letter of Intent (LOI) between both countries signed on September 17, 2017. In addition the contract also includes a clear intention to buy the Hawk. Note: the total number of Typhoons was not stated therefore the total number is currently listed as Typhoon F2 variant. Airbus D&S didn't report the Typhoons as ordered by December 31, 2017. On June 6, 2017 the last two Typhoons were delivered from Warton to the Royal Saudi Air Force. 16 Typhoons will be withdrawn from service and flown to RAF Shawbury for storage and then inducted into the Reduce to Produce (RTP) program. Typhoon T.3 5 and 8 twin seat aircraft. New and upgraded Typhoon T.1/T.1As. All Typhoons originally delivered as block T.1, T.1A and F.2 have been upgraded to the T.3 and FGR.4 standard. 14.09.17: Royal Saudi Air Force, lost during combat operations in Yemen, pilot didn't survive the accident. 24.09.17: Italian Air Force, lost during an aerial display, pilot didn't survive the accident. 12.10.17: Spanish Air Force, lost on approach to Albacete Air Base after fly-past over Madrid, pilot didn't survive the accident. The first tranche 1 Typhoons are withdrawn from service and stored at RAF Shawbury. RAF 9 squadron currently operates the Tornado until 2019. The squadron will transition to the Typhoon. 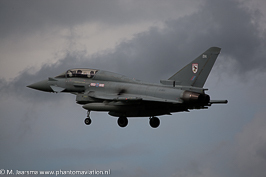 RAF 12 (B) squadron was reactivated as joint squadron with Qatar training their pilots. Austrian Air Force EF-2000 from the Überwachungsgeschwader at Zeltweg air show 2011. German Air Force TLG 31 EF-2000 display at Karup air show 2014. German Air Force TLG 31 EF-2000(T) taxiing at his homebase Norvenich in 2015. 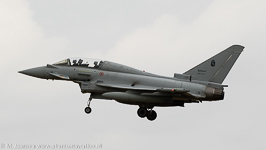 Italian Air Force EF-2000 / F-2000 from 4° Stormo on approach to Volkel AB in 2015. Italian Air Force EF-2000(T) / TF-2000 from 4° Stormo on approach to Norvenich AB in 2015. 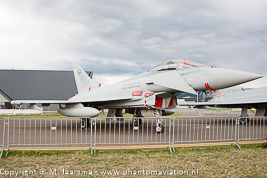 Royal Saudi Air Force Typhoon F.2 participated at Zeltweg air show 2011 before being delivered to 3 squadron. 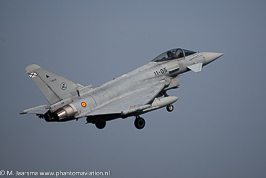 Spanish Air Force EF-2000 from Ala 11 arriving at Leeuwarden AB to take part in exercise Frisian Flag 2014. 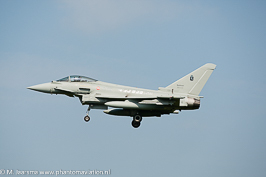 Royal Air Force Typhoon T.3 from 29 squadron arriving at Leeuwarden AB to take part in exercise Frisian Flag 2012. 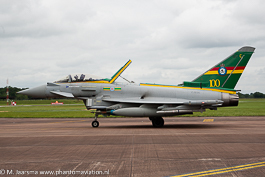 Royal Air Force Typhoon FGR.4 from 3 squadron departing RAF Fairford after static display RIAT 2012.